Synthetic rigging (also referred to as composite rigging) is disruptive technology that in time will replace stainless steel wire rigging. Since marine surveyors will increasingly come into contact with this type of rigging, they need to understand this new technology to enable them to carry out surveys on craft which use it. Many new types of synthetic fibres have been discovered in recent years. Typically, they are initially used in aerospace applications and later become available for other application where high performance is required. Most of the high performance fibres are characterised by impressive tensile properties, which with the exception of carbon fibre significantly exceed their compressive strength. With yacht rigs, the mast, spreaders and struts are the only components taking compressive force, and the shrouds (stays) operate as tension only structural members. Therefore, the impressive tensile properties of these fibres make them ideal for standing rigging. PBO (Zylon): PBO is short for (polybenzoxazole) is a trademarked name for a range of thermoset liquid-crystalline polyoxazole. This synthetic polymer material was invented and developed by SRI International in the 1980s and is manufactured by the Toyobo Corporation. In generic usage, the fibre is referred to as PBO. Carbon Fibre: Carbon Fibres are long parallel chains of carbon atoms that are formed by stretching and heating certain forms of organic filaments. Carbon fibre laminates have fatigue limits far in excess of steel and excellent vibration damping characteristics, but have poor impact strength. Carbon fibre is commonly used high performance fibre which is extensively used in the marine industry for high performance structures including hulls, masts and rigging. Aramid: A para-aramid synthetic fiber with the trade name Kevlar was developed at DuPont in 1965 and first used commercially in the early 1970s. A similar fiber to Kevlar called Twaron with roughly the same chemical structure was developed by Akzo in the 1970s with commercial production started in 1986. Twaron is now manufactured by Teijin. HPME: Spectra fibres were first introduced into the marketplace in 1985, after a decade of intensive research, engineering and development by the Allied Fibres division of Allied Signal Technologies. Spun from a solution of Ultra High Molecular Weight Polyethylene (UHMWPE), HPME fibres combine a very high degree of molecular orientation with a very low density which results in fibres with unique and quite extraordinary performance profile. Even among the so-called high performance fibres, the unique physical properties of HPME place it in a class of its own. It is marketed under the trade names of Spectra and Dyneema. Most forms of synthetic rigging exhibit stretch over time (creep). However, creep can and is controlled by appropriate design with stretch equivalent sizing being used. • Continuous rigging: Using continuous fibres the vertical and diagonal shroud elements are fused to form a single, homogeneous piece of rigging. 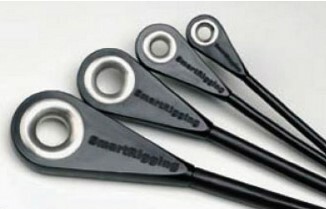 • Fibre rod rigging: Using thin pultruded rods, bundled together to achieve target strength. • Fibre solid rod rigging: Using rigging elements that are formed as a solid rod like traditional rod rigging, not bundled. With continuous rigging and endless winding, fibres are wound around terminals as part of the manufacturing process (see figure 1). When using fibre rod rigging the fibre bundle is typically bonded into terminal fittings. While with rope rigging terminals of similar concept to Norseman Sta-Lock are used for parallel fibre type while the stranded rope form is spliced around special thimbles similar in concept to Merriman thimbles (see figure 2). 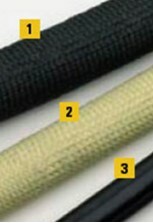 With the exception of Carbon Fibre solid rod rigging and HPME stranded rope rigging, the fibers are packaged in some form of sheathing to protect the product from physical damage and exposure to the elements, particularly moisture and UV light (figure 4). Stranded rope rigging made from HPME fibers is not adversely affected by moisture and UV light so it is not sheathed, but may be surface treated. 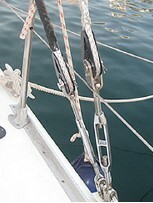 Synthetic rigging is gaining acceptance and widespread use on sailing craft of all forms, from monohull to multihull, racer and cruiser with typical usage being indicated in table 1. PBO rigging has had over a decade of proven success at the America’s Cup level. As an example, PBO is claimed to be 65% lighter than traditional rigging at 110–130% of the price of rod rigging. PBO, Carbon and Aramid rigging as it is made to specific length, terminated and sheathed using specific processes and equipment, it is typically provided by specialist rigging companies as a manufacture and fit service. HMPE particularly that based on stranded Dyneema SK75 rope rigging is cost effective for cruiser and cruiser/racer craft. HMPE specifically Dyneema SK75 is typically sold under trade names Dynice DUX (Hampidjan) and STS-12 (New England Ropes) and is braided rope of 12-strand construction. Dynice DUX is heat set which removes constructional elongation and further reduces stretch increasing its performance and suitability for use as standing rigging. 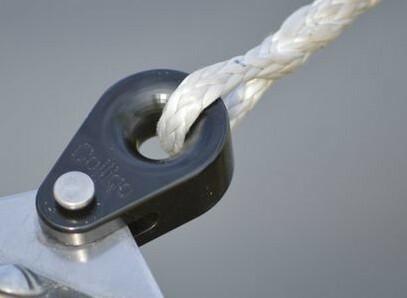 Since the ends are spliced and since companies like Colligo Marine in the USA manufacture and supply innovative connection hardware it has allowed this HMPE rigging to be provided by smaller rigging companies or done by individuals as a DIY project (see figure 4). Synthetic rigging results in a more reliable rig, a stiffer, faster boat with greatly reduced pitching moment. Reducing weight aloft on any sailing craft lowers the vertical position of the center of gravity (VCG), which dramatically improves a yachts handling, stability, and response. 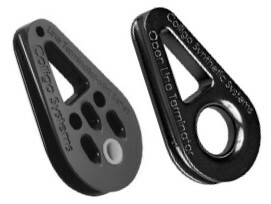 Consequently, moving to synthetic rigging can represent a cost effective “upgrade” for any type of sailing craft. Based on acceptance and use of affordable synthetic rigging marine surveyors will increasingly surveying craft using HMPE rigging. Inspection of HMPE rigging is easier and outcomes are more conclusive than traditional stainless steel wire rope rigging inspections as all aspects of terminations are visible (see figure 4). Lifespan of synthetic rigging, if well cared for, is expected to be at least as good as wire rigging, however many rigging suppliers based on specific experience indicate longer lifespans. Since the use of synthetic rigging is relatively new, data regarding lifespan is still being gathered. The innovative use of HMPE is growing, with applications in replacement of lifelines and “soft” shackles. This article is an introduction to this subject. The IIMS will be publishing a Self Help Handy Guide – “What a Marine Surveyor needs to know about Synthetic Rigging”, which covers the subject in greater depth, provides data and suggests types of inspection required for synthetic rigging. The author would like to thank Colligo Marine and AramidRigging for allowing the use of their pictures. Kevlar, Dyneema, Twaron, Spectra, PBO, Dynice, DUX, STS and any other trade names indicated or inferred are all trademarks of their respective manufacturers. New England Ropes is a Teufelberger brand.